From the waterways of the Okavango Delta to the arid salt pans of the Makgadikgadi, Botswana is a land where the desert meets an oasis. A land where wildlife still roams freely over vast distances and the Milky Way glitters in all its glory above. A land still home to the San Bushman, the original inhabitants of this great continent, Africa. Nothing compares to the wealth of space in a land time forgot. With their passion for wildlife, pristine wilderness and ancient people, join David and Robyn Foot on safari exploring the remote areas of this extraordinary country. 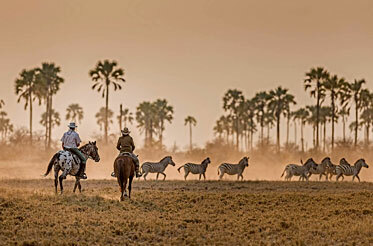 Their first love is to share Botswana with you on horseback or, alternatively if horses are not your “thing”, then discover Botswana either by 4×4 or on an adventurous “foot” (walking) safari. Take to the water on an adrenalin packed canoe safari along the Selinda Spillway or a boat safari deep into the heart of the Okavango Delta. Our journey through Africa over the last 45 years has led us to Botswana, a vast country of endless wilderness and some of the highest concentrations of wildlife to be found anywhere on the continent. There is so much to explore and many adventures ahead. We are enthralled to be able to call the Thamalakane River our home, to be riding through the huge pans that dominate the centre of Botswana and to regularly venture into the Okavango and other wildlife rich areas. Using private tented camps, David will take you on a tailor made journey into any of the renowned wildlife areas of Botswana. With his passion for the wilderness, its wildlife and birdlife, he will bring the bush alive and provide you with a lifetime of adventures.Whatever your passion you can explore the country with him on horseback, by vehicle, on foot, by boat or canoe. 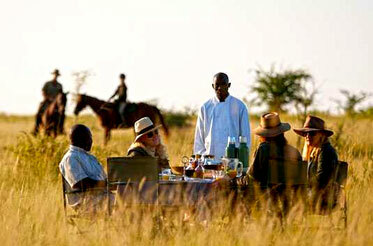 When not on horseback some of his favourite safaris are the Selinda Canoe Trail and the Spirit of the Delta.